Bombardier announced that its all-new CS100 aircraft has successfully completed all noise performance testing and preliminary data confirms it is the quietest in-production commercial jet in its class. The aircraft’s noise performance and its short-field capability make it ideal for city centre operations. The first production CS100 aircraft will soon commence function and reliability testing, signaling the start of the final flight testing phase. 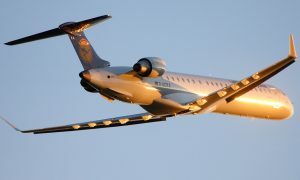 For these tests, the aircraft will operate on a commercial airline type of schedule from key airports in North America. 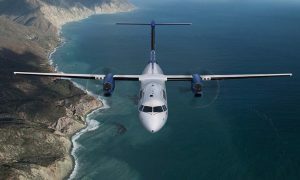 The announcements were made today on the occasion of a CS100 flight demonstration at Bombardier’s Toronto site where the aircraft performed for employees, local government representatives, business leaders, media and Toronto-based C Series customer and long-time Q400 operator, Porter Airlines. The demonstration aircraft, flight test vehicle five (FTV5), was painted in the livery of launch operator Swiss. “It’s always a thrill to see the C Series aircraft in a new city and today marks a proud achievement as we experience the aircraft’s Toronto debut,” said Fred Cromer, President, Bombardier Commercial Aircraft. We announced previously that the C Series aircraft are exceeding their original targets for fuel burn, payload, range and airfield performance. Now we are delighted that the CS100 aircraft’s noise performance tests have confirmed it as the quietest in-production commercial jet in its class. The C Series certification program is now over 85 per cent complete,” added Mr. Dewar. Earlier this year, Bombardier announced that the C Series aircraft’s maximum range is confirmed to be up to 3,300 NM (6,112 km), some 350 NM (648 km) more than originally targeted. 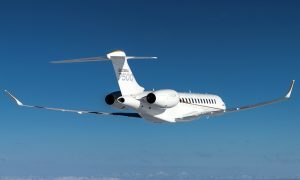 The aircraft is delivering more than a 20 per cent fuel burn advantage compared to in-production aircraft, and a greater than 10 per cent advantage compared to re-engined aircraft. This means that one C Series aircraft could reduce an operator’s carbon emissions by up to 6,000 tonnes each year. The C Series will also emit 50 per cent fewer NOX emissions than the CAEP 6* NOX emission standards.